MHCT, speed is dependent on two major factors: the number of detectors simultaneously sampled and the gantry rotation period . With a similar collimation and gantry rotation time, a four-channel MHCT scanner will reduce scanning time by a factor of 4. Reduction of gantry rotation time to 0.5 sec has recently been introduced. Compared to a single detector scanner with a 1-sec gantry rotation time, a four-channel MHCT scanner with a 0.5-sec gantry rotation time will result in scanning 8 times faster. Thus, depending on technical parameters, a MHCT scanner may allow scanning at a rate 4 to 8 times faster than that of a typical single-detector scanner. Faster scanning time allows for several advantages over single-detector scanners as follows: increased length of coverage during a single breath hold, use of less intravenous contrast volume, improved consistency in phase of enhancement throughout the imaging volume, and decreased respiratory and cardiac motion. single-detector CT angiography have been nicely demonstrated in a recent study by Rubin et al. . In this study, the authors compared single- versus four-channel helical CT angiography in the assessment of 48 patients with aortic aneurysm or dissection. In comparison to single-detector CT, four-channel MHCT was 2.6 times faster, resulted in a scanning efficiency that was 4.1 times greater, and was associated with a contrast efficiency that was 2.5 times greater. 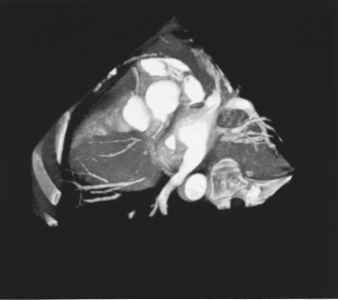 MHCT also allowed for a 57% decrease in contrast volume without a significant change in aortic enhancement. Despite a roughly 60% shorter scanning duration, MHCT still allowed for a mean reduction in slice thickness of 40%. These authors found no advantage of single-detector CT aortography over MHCT aortography. 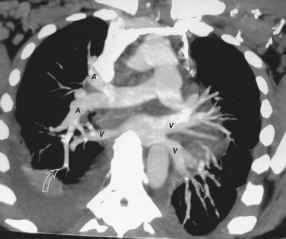 Figure 7 MHCT pulmonary angiography. Rotational ("paddlewheel") 2D reconstruction  image shows ability of MHCT to image subsegmental pulmonary arteries (arrow). 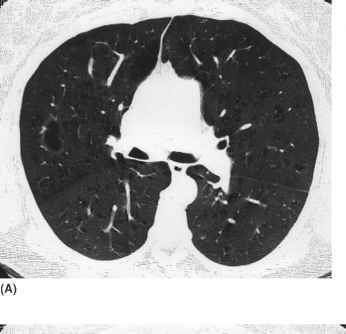 Also note ability to connect peripheral and central vessels as well as the ease with which to distinguish pulmonary arteries (A) from veins (V) using this reconstruction method. Small pleural effusions are present. rotation period and a 180° reconstruction algorithm currently provide a temporal resolution of 0.3 sec [4,10]. Such fast scanning, coupled with EKG gating, allows for coronary artery evaluation [4,10], a technique that was previously limited to electron beam CT scanning. To date, the precise role of MHCT in the evaluation of coronary arteries has yet to be determined.